Display macros on the group entries. Right now, it only lets you show one thing. I have it set to sum calories. It would be really nice if you could have it show macros as well so I can see calories, protein, fat, and carbs at a glance for a given meal. That's a great suggestion - we will discuss adding additional columns to the diary table on the website. It would be great to have the ability to customize your diary to include more information for each item and diary group. When you click on a food, diary group or selection of foods, your nutrient targets will update below to show you how much of each nutrient you are getting from the selected items. Oh that's cool. I didn't know you could do that. I use the Android app 99.9% of the time, I probably should have stated that in the original post. The feature should be equally applicable though as there is plenty of space in the diary group header. Is there thoughts on being able to select groups in the app as well to see nutrition information as well like on the web application? You can find this information on the mobile app too! Swipe the diary header group to the right to reveal a gear icon on the left. Tap the icon and select Show Nutrition Summary. You will see the Nutrition Summary for that diary group. Holy cow that's awesome! Didn't know you could do that. I still like the idea of being able to add additional columns to the diary group, but this helps me now. Thank you! Ethan, I too am really hoping to add extra columns on the diary. I have a rare condition called LPLD which means I have to track my carbs, fat, and calories very carefully throughout the day as I'm missing certain enzymes in my blood that break the things down. It would be a HUGE deal to me if we could add columns to the diary page! Are you still hoping for it as much as I am? 1. Check out the macros in the Add Serving dialog when you add a food to your diary. This will list the amount of each macro in the selected serving size. Hover over each segment of the circle on the left to see the % of calories coming from each macro too! Click on a food, diary group or selection of foods, to see the nutrients from the selected food(s) only in your diary below. 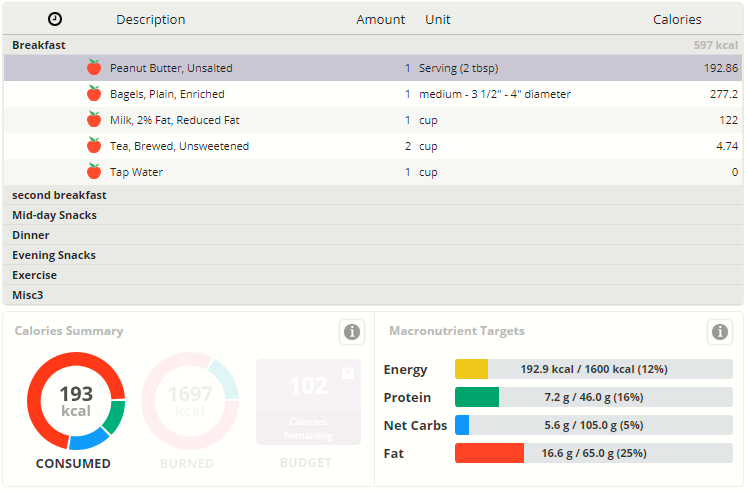 Clicking on a food will update the Macronutrient Targets section below the diary so you can quickly see the macro breakdown. I hope those will help in the meantime! Thanks Karen, will make do for now. Have noticed both features you mentioned-- the UI is very intuitive and I really appreciate that!